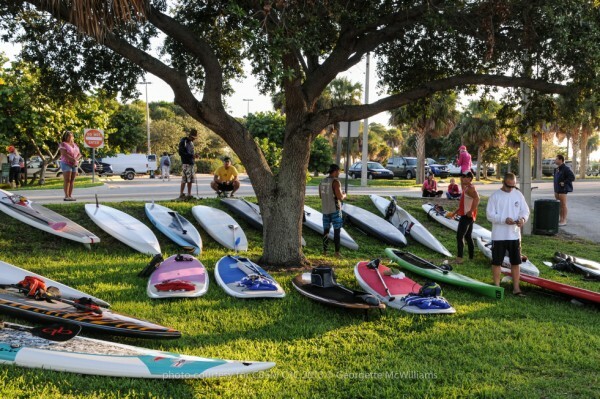 For the seventh annual Causeway to Causeway Paddle Challenge (C2C), a fundraiser for the Cocoa Beach Surf Museum, we made a major change to take advantage of what we have learned from previous years. 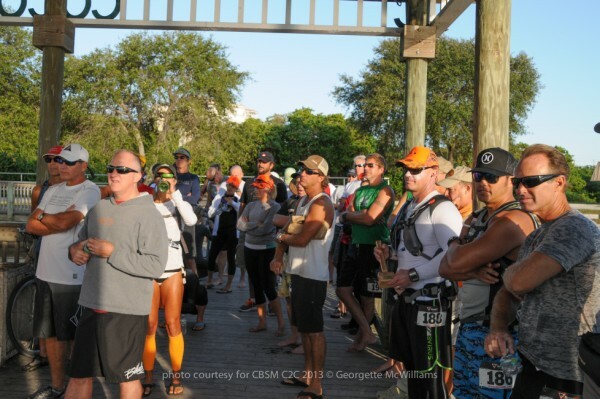 From the beginning, the C2C was a 22-mile course starting from Lee Wenner Park in Cocoa Village down to the Pineda Causeway and back (with a one-way 11 short course option). Due to the prevailing north winds that begin this time of year, the paddle back to the north has often been a grueling trek against the wind and on two occasions we have had to cancel the return leg altogether. Last year the conditions were so severe, with winds at 25 to 35 mph, we almost cancelled the event. A last minute decision to hold the event as a one-way paddle to Pineda paid off with the most exciting event in the history of the C2C. The conditions created the perfect scenario for a downwind paddle that allowed paddlers to essentially surf down the river for 11 miles. 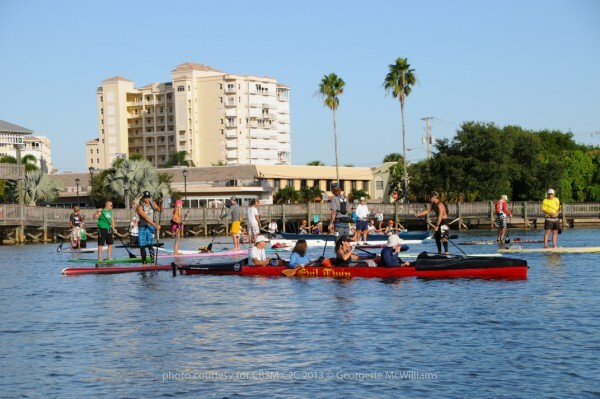 This year the course was changed to a one-way paddle from Lee Wenner Park south to Oars and Paddles Park, just north of the Eau Gallie Causeway, a total distance of 17.5 miles. We were hoping for the blustery weather we typically get this time of year, but, of course, the weather did not cooperate. Instead we had sunny skies, mild temperatures and light winds. However, no one seemed to be deterred by the beautiful weather since we had a record turnout of over 50 paddlers. 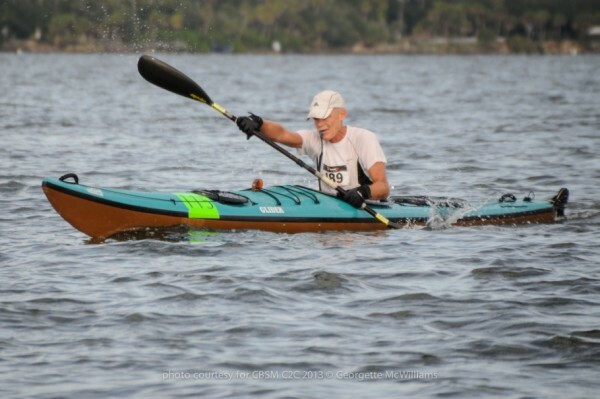 As usual, we had a mix of speedsters and pleasure paddlers with roughly an even mix choosing the 11 mile “short” course. For the 17.5 mile course Reid Hyle once again led the pack by a wide margin on a Surfski, with a blistering time of 2:11:46. 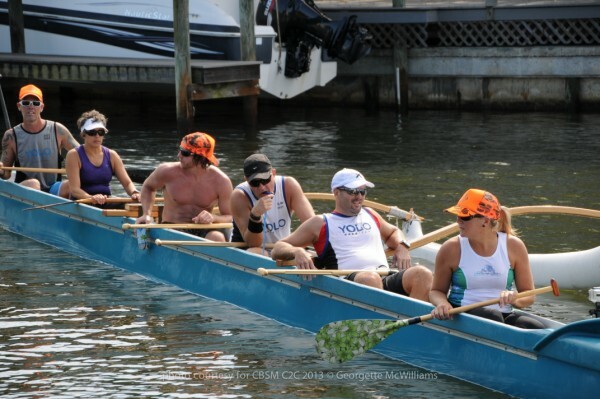 Second was the six- man outrigger canoe of Team YOLO with a time of 2:29:30. 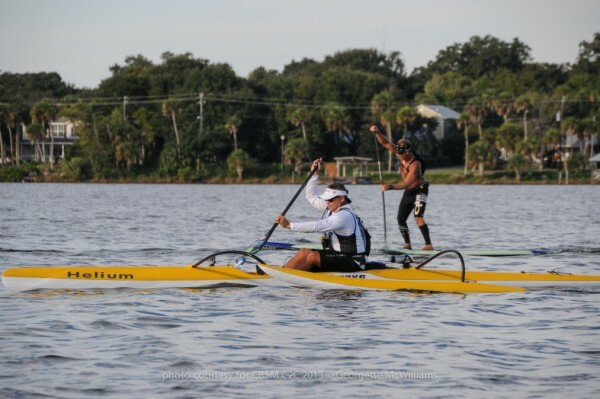 In third was paddler Andrew Morriss coming in at 2:30:20. 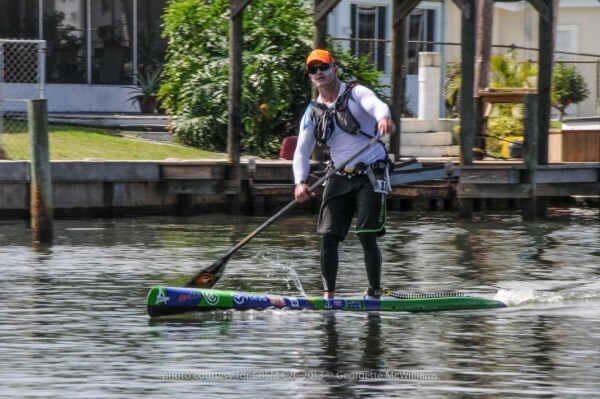 The top finisher for the 11-mile course was Helga Goebel in the 12’6″ SUP category, taking a break from the nearby SUP throwdown contest, with a time of 2:08:59. Right behind her with a 1-2 finish for the ladies was Kristen Apotsos coming in at 2:11:40, followed by Christian Grouse, on a 14ft SUP, at 2:12:36. 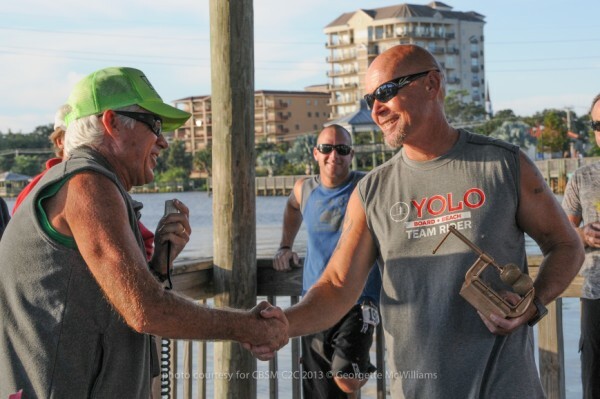 The C2C is a non-trophy event, but this year was a special occasion and awards were given to the only two individuals who have attended every C2C since the first in 2007. Chip Bock received “The Golden Hammer Award” and Gary Wise was presented with “The Golden Ballbuster Award” for subjecting themselves to the annual punishment for the last seven years. I handcrafted the awards out of 2×4’s, items from Harbor Freight, and a can of gold spray paint. As always, the event ended with lunch and a raffle, giving everyone a chance to re-fuel and socialize. Thanks to Doubles Beachside for providing the sub sandwiches and Sunseed Co-op for the fruit, snacks and drinks. A thank you also to our sponsors providing the raffle items – X-Trak, Paddleboard House, Dry Case, Blue water Polarized and Paddle Style… What’s Yours? Mahalo to our volunteers who worked hard to make this happen: Boat operators – George and Nyla Trossett, Matt and Johnny Bellina, Larry Rother and Capt. Kim from Sea Tow Sebastian; Timekeepers/Sherpas -Tommy Ricketson, Ron Casey, and Jim Dale; Official photographer, Georgette McWilliams; Drivers Bill Tweedie of Myco Trailers, Casey Baker of Resolute Racing Shells and Jennifer Meecham from Epic Boardsports; and finally, Melody DeCarlo our food-prepper and President of Cocoa Beach Surf Museum.